Every 8 seconds someone in the US gets a serious blow to their head., Doctors often have difficulty measuring how badly the person is hurt even with CT and MRI scans. This is because concussions do not show up on these tests. The brain appears normal even though it does not function normally. Even when someone has a known brain injury, it is difficult to tell if they are getting better or worst over time with standard testing – CT and MRI. However, using eye-tracking cameras, we can record the person’s pupils as they follow an object moving across a screen. Compared to normal healthy people, the injured person’s eyes have difficulty converging on a focal point as that point moves and one eye may lag behind the other. Those that have swelling in the brain show significantly different eye-tracking patterns, which can actually help localize where the injury may have occurred, according to neurosurgeon and PhD researcher Uzma Samadani, MD. Eyes can tell us the story and the eye movement can be a window into the brain. Eye movement tracking can show us the damage caused by a concussion on anyone, regardless of age, gender, education, race, language, or mode of injury. 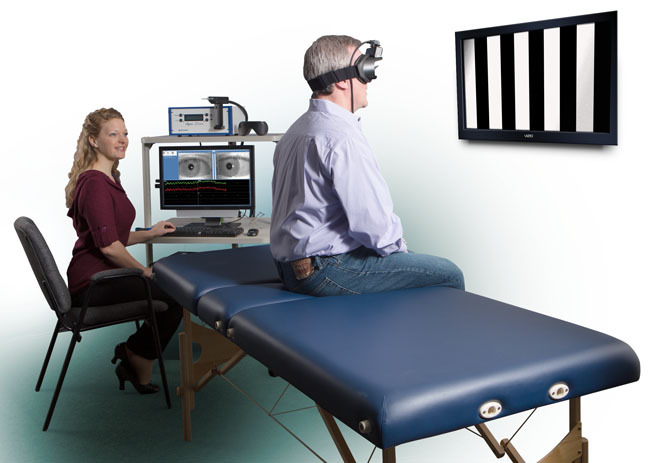 Thanks to eye movement technology, effects of concussions are no longer invisible. We can detect whether the brain sustained an injury, measure it, and even quantify whether the brain function improves or worsens over time. Locating the trauma site enables us to find ways to treat it, thus improving one’s quality of life. In our office, we use Videonystagmography (VNG), a complete diagnostic system for recording, analyzing, and reporting eye movements. The system uses video imaging technology, high technology video googles, and infrared cameras. VNG includes a series of tests that determine whether a vestibular disease may be causing a balance or dizziness problem, or whether poor concentration or fatigue may be brain based. VNG can differentiate between a central nervous system lesion, easily missed during a physical exam, or a peripheral vestibular lesion. Central lesions can be located in the frontal/frontoparietal cortex, parieto-occipital region, basal ganglia, brainstem, cerebellar vermis or flocculus. If the lesion is located in the peripheral vestibular system, the VNG can decipher between unilateral and bilateral vestibular loss. VNG helps decide whether additional tests (e.g. MRI) are needed. "Take care of your body, it is the only place you have to live"